LES FEMMES - THE TRUTH: Which of These Symbols has been More Deadly for the Black Family? Please, it does not have to be either or. There were atrocities in the confederacy including eugenic slave breeding . Hanging onto that flag is simply not worth it. Wow! So you are part of the demonizing of the South movement? The North wasn't exactly kind to indentured servants and the "slave labor" immigrants working in the stockyards of Chicago and the meat packing industry. Even in the 1900s they were exploiting children as young as three. Most of the people in the South never owned a slave. Many never even saw a slave. In the entire Shenandoah Valley of Virginia where many of the Civil War battles took place there were a total of 400 slaves. And, as a matter of fact, tens of thousands of slaves were owned by free blacks, some of whom were incredibly brutal. There is no time or people that hasn't exploited the weak and vulnerable, usually for a profit as Planned Parenthood illustrates today with their murder of the little ones in the womb. Demonizing all those who fought for the South in the Civil War is to rewrite history for politically correct feel-good sentimentalism. It's a lie, which makes it dangerous. The Confederacy primarily fought because they were invaded by the North. Lincoln deliberately precipitated the crisis by violating the state rights of South Carolina when he forced the conflict at Fort Sumter in Charleston. The Confederate flag is a symbol of state rights (vs. federalism) and Southern pride more than anything else. To turn it into a symbol of hate is a lie and a detraction. 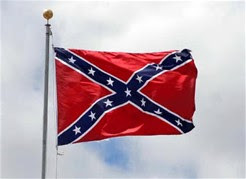 I'm sick of the demonization and would gladly fly any one of the confederate flags. And I will say it publicly rather than in an Anonymous comment. I make no defense of the north but the south fought for slavery. See http://www.civilwar.org/education/history/primarysources/declarationofcauses.html#South_Carolina if you don't believe me. I don't blame every southerner but I do blame the confederacy, which defined itself by slavery. As and ACW devotee, there isn't much room for non-facts when it comes to the causes of the Civil War. There were many not the least of which was nullification/secession legality, slavery, political power (population growth, railroads, etc) swinging to the mechanized north and mid west and the souths's fear of lose. There can be no doubt that the confederacy was founded on slavery as their constitution specifically called in out as legal. Equally, no doubt, a crafty Lincoln used the slavery issue to further his plans to change the war from about states rights to something bigger - freedom for all. The issue of the confederacy was settled with blood. It was settled honorably by people like RE Lee, Joe Johnston, US Grant and Lincoln. It's done. It's over. We should be praying for those who died on both sides of the line. IMO (and I am of a certain age and education), only view the confederate flag as a symbol of remembrance for what this country had to pay to get rid of slavery. And, as a symbol of pride and resistance in service to a poor but honestly held belief system. IMO, juxtaposing. the confederate battle flag with PP just doesn't make any practical or historical sense. I understand the reason behind doing so is to get people to think about both. But, it just doesn't work. IMO, we are better off listening to Mr Franklin. "We must all hang together, or assuredly we shall all hang separately"
You are absolutely correct Mary Ann. The Civil War was not really about slavery.